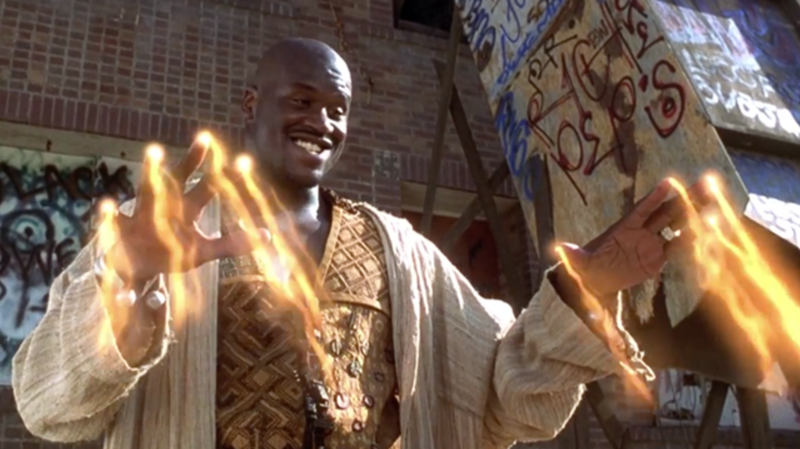 Remember the movie Kazaam, starring basketball superstar Shaquille O’Neal as a 5000-year-old rapping genie? Released in 1996, and marketed as “slam-dunk fun,” Kazaam was a major flop, making back less than $19 million of its $20 million budget. At the time, famed film critic Gene Siskel named it one of his least favorite movies of the year. Still, plenty of '90s kids look back on the film with nostalgia, and over the last two decades it has become, if not beloved, at least fondly remembered. Whether you loved it or hated it, you’ve probably wondered at some point how the heck a movie that bizarre ever got made. Fortunately, the folks over at /Film had the same question, and decided to talk to some of the film’s cast and crew to get to the bottom of the movie so weird that its own star later called it "so bad that it was strange." It turns out that, while Kazaam’s combination of hip-hop, sentimentality, and Shaq might have seemed like a cynical money grab (Roger Ebert called it “a textbook example of a filmed deal”), the folks behind its production really put their hearts into making the film. The behind-the-scenes story of the film—as told by its director, star, writers, costume designer, and production manager—is surprisingly moving. It centers around heartbroken director Paul Michael Glaser, whose wife had recently passed away, throwing everything into making an emotional genie movie that would teach kids about growing up—and resuscitate his career in the process. There’s also child actor Francis Capra, who was being told "that I was 'too urban' or that I had a 'weird look'" by most casting directors and saw Kazaam as his big break; two inexperienced writers, Christian Ford and Roger Soffer, who expected to be fired from the film every day; and costume designer Hope Hanafin, who threw all of her energy into creating historically accurate 18th-century Middle Eastern outfits for Shaq to wear as a hip hop genie. “In my opinion, the core idea had huge value. And it had emotional value as well," explains Soffer. "But in this case, it was inextricably intertwined with Paul’s emotional—and tragic—situation. He had a deep and powerful connection to something he wanted to see on the screen because of the loss he’d experienced and still was experiencing." Check out the full oral history at /Film.